Harbor Teacher Preparation Academy (Wilmington, CA). 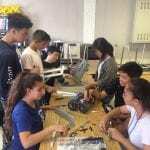 Challenge Los Angeles is a 7-week competition in which students from LAUSD high schools select an issue and develop solutions to complex problems facing their communities. HTPA students formed Harbor 4 Hunger, focusing on promoting healthy eating habits and free food resources. Students connect food donors with local charities running food pantries; create emergency food boxes for local schools; and participate and run food tabling services at local markets and businesses and food drives at local schools. The activity is designed to promote civic responsibility, leadership skills, teamwork, and discussion with local experts.